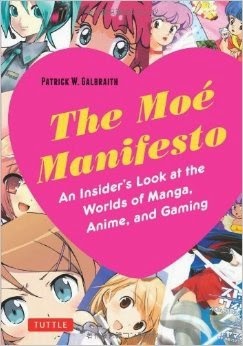 The Moe Manifesto is a collection of interviews conducted by Patrick Galbraith touching on the subject of Moe and its impact in culture of Japan and in the worlds of Anime, Manga, and Gaming. Each person interviewed that Galbraith interviewed is someone that has or is currently working in the industry. Some of his interviews have included those that are in the field of economics, psychiatry, and cultural studies. In this book Galbraith gives the reader a better understand of the definition of the word Moe, but he also gives readers a definitive insight the impact the word Moe has on those that feel it and the effect it has on the world around them. The book itself is softcover with tons of illustrations by well known manga artists and characters designers of well known games and animes. It also includes photos of each person being interviewed and photos of cosplayers when discussing the subject of cosplay or maid cafes. The binding of the book is held together with glue, so it may come apart when trying to spread the book flat. Moe is described as an emotional response for or towards something fictional. The feeling of Moe can be elicited by a character in an anime or manga, an idol singer's character, or even by a cosplayer cosplaying a certain character. While the anime and manga characters elicit the most Moe responses, it is not uncommon to feel Moe towards a person portraying a character. In an interview with voice actress Momoi Halko, she says that when she dresses up like the characters she has portrayed, she gets a greater response from the fans because of Moe. There are fans that are happy to see her, but it's her Otaku audiences that really go all out for her and the series she's in. It would be the same here in US if a voice actress such as Tara Strong cosplayed as Bubbles or Raven at a convention. Tom Hiddleston did exactly that at SDCC when he appeared before a live crowd at a panel dressed up as his Avengers character Loki. While he is an amazing and popular actor, wearing that costume in front of his fans and reciting lines from the movie evoked such strong feelings of Moe. The feelings were so strong that there has been art work, memes, gifs, and fan fiction relating to Tom Hiddleston's portrayal of Loki. I find it funny that a show like 30 Rock tried to mock Japan for Moe, without actually understanding it, but meanwhile in the United States fans have shown that we do have a clear understanding of Moe without really understanding what it is that they are feeling. The book also goes into the early days of anime when it was as basic as anime for boys and anime for girls. When the Anime “Creamy Mami” came out, the animation studio Pierrot was surprised to find that in the middle of the season that there was a huge older male audience. When doing events for the Anime they saw that the majority of the fans that showed up were male. At that time the term Otaku wasn't that widely used and not so much in a positive light. The rise males getting into more magical girl anime changed how the anime industry approached their story telling, their artwork, and even their marketing. The Akihabara shopping district was changed because solely on the fact that more specialized customers were flocking to that area, first for computer hardware, then eventually anime, manga, video games, toys/statues, etc. One of the ideas behind Moe that make it so prominent is the culture from which it stems from. You get an idea of why so many adult males are experiencing Moe. It’s not so much that these are lonely men that can’t talk to women, it the fact that Japanese society has branded Otakus as undesirable. If you are not the typical salary man who can take his wife out to expensive restaurants on a regular basis, you become ostracized from society. So instead of seeking out true companionship they chose to find comfort in the form of a 2D character that will not question who they are as a person, a character that they feel needs their attention, and can continue to get to know and grow with at their own pace without pressure from anyone. This book, The Moe Manifesto, really sheds light on what Moe is and its impact on people and society in Japan. It does not condemn it in any way; it goes into great lengths with its interviews covering various themes to better understand Moe. Just like how Otaku was once used as a negative, after reading this book you can see the positive in the Moe lifestyle. I would gladly recommend this book for those curious about what Moe is or to those that just interested in learning other aspects of Japanese culture, specifically otaku culture.